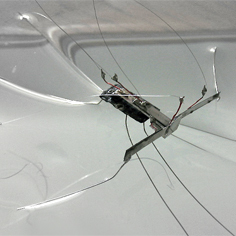 "Water-strider robot research is an example of fun-driven research rather than a fund driven one," said Metin Sitti, associate professor in Carnegie Mellon's department of mechanical engineering, the Robotics Institute, the department of Electrical and Computer Engineering and principal investigator for the project. "We have had a lot of fun of understanding the biological principles of water-strider insect locomotion on water and adapting those principles to robotic systems." The goal is to develop a microrobot that can stay and maneuver on water with power, efficiency and agility by taking advantage of the water's surface tension. The team of Carnegie Mellon researchers — which includes Yun Seong Song, Akshay Jayaram, Ian Price and Jeremy Wolgemuth — expects to continuously improve the robot's ability to float on water by studying the physics of water striders in nature and using micro-actuators to simulate their movements. Sitti says the university is in contact with several large-scale toy companies to commercialize the robot for entertainment and educational purposes in the near future. "We are also expecting other new applications related to quality and biochemical monitoring of water resources," he said. In addition to the water-strider robot, Carnegie Mellon's NanoRobotics Laboratory researchers are also investigating robots that can swim and fly. Sitti envisions a day when microrobots navigate through human fluids, looking for signs of disease.